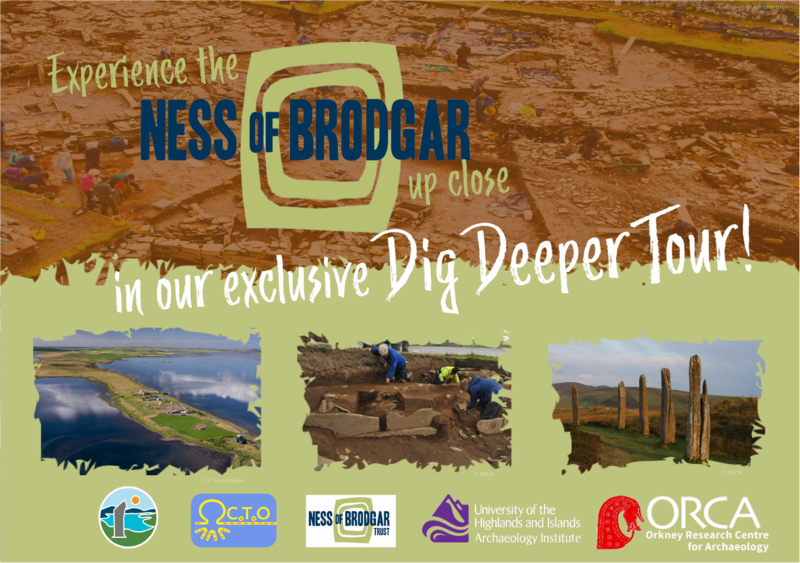 Ness of Brodgar Dig Deeper Tour! 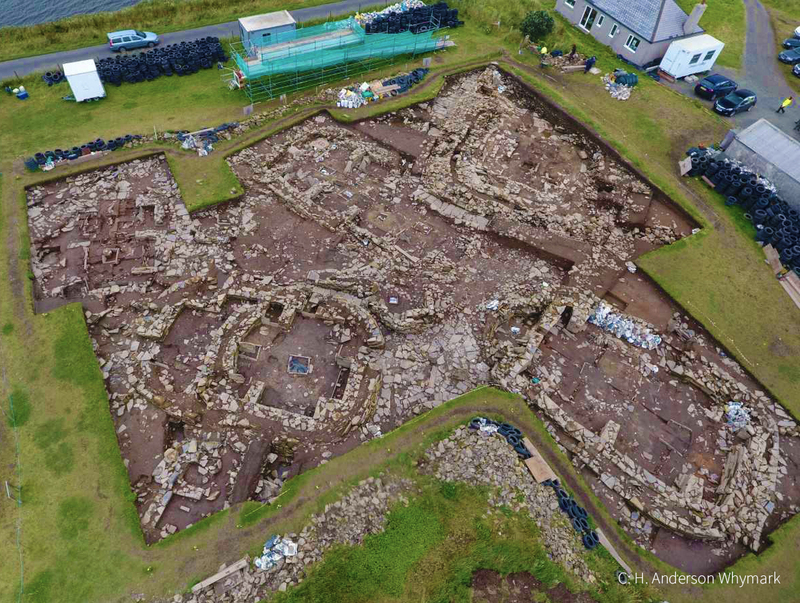 Experience the Ness of Brodgar excavations in a 3 hour private tour guided by expert archaeologists with access to areas not usually open to the public! What is the Ness of Brodgar? The Ness of Brodgar is a unique 5,000 year old ritual complex and site of a world famous excavation. 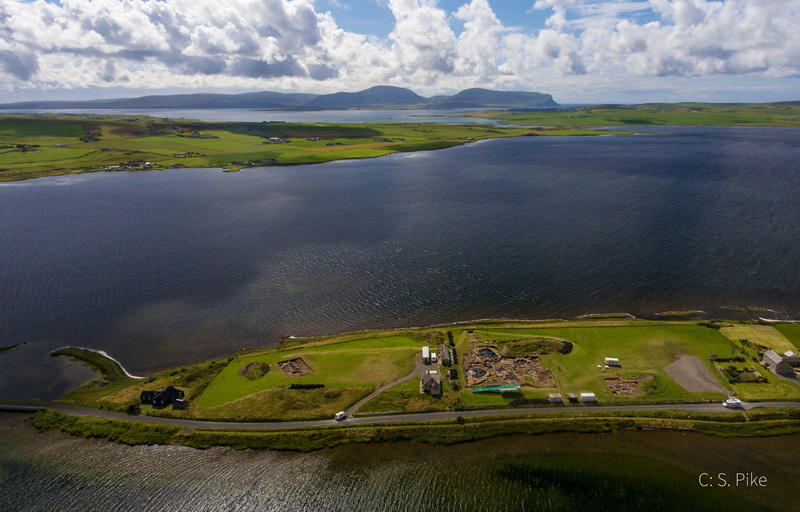 The site is located at the heart of the UNESCO World Heritage Site “the Heart of Neolithic Orkney”, between Maeshowe and Skara Brae, on a beautiful strip of land which separates the freshwater Loch of Harray and the seawater Loch of Stenness. An important home for birds, otters and seals today. And what tales the stones tell. The dig has revealed a society with an advanced knowledge of architectural skills and stone-working technology. Every artefact is a piece of a larger jigsaw, telling us more about the lives of the inhabitants of Neolithic Orkney. The complexity and scale of the buildings imply that this site was far more than just a place where people simply lived. Some of the artefacts found have come from as far as the Lake District and Stonehenge showing movement from far and wide to the Ness. The remnants of their lives, including the largest assemblage of Neolithic art in the UK, show us that this area was one of deep significance, a ritual and political hub which was active for over a millennium. To find out more about the Ness of Brodgar you can visit the dedicated website. Julie is an artefact specialist with over 20 years archaeological experience. She has worked at several archaeological sites around the world, including the Roman town of Silchester in the UK and the Neolithic town of Çatalhöyük in Turkey. She has worked with the archaeological collections at Orkney Museum and is presently a PhD student at the Institute of Northern Studies, UHI. Chris has a degree in British Archaeology from the University of York. For a number of years Chris worked at Portmahomack, the excavation of a Pictish monastery in Easter Ross. 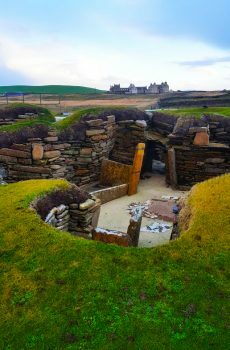 Since moving to Orkney 15 years ago he has developed a passion for the Neolithic period and in 2007 qualified with the Scottish Tourist Guides Association as a Green Badge guide. Chris served for many years on the committee of the Orkney Archaeology Society and now provides tours for cruise ship passengers and private groups to the archaeological wonders of Orkney. 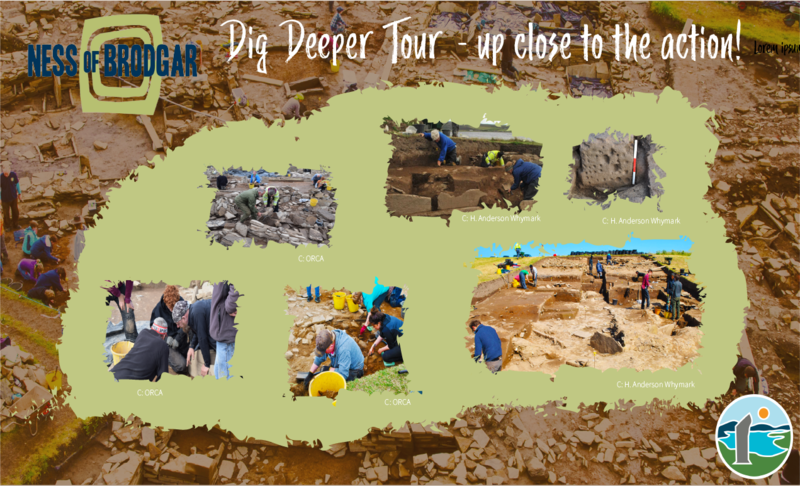 The Ness of Brodgar Dig Deeper tour takes you from Kirkwall to two iconic Neolithic sites – the excavation and one of the nearly stone circles – then returns you to Kirkwall. You will be guided by your very own professional archaeologist for three hours. 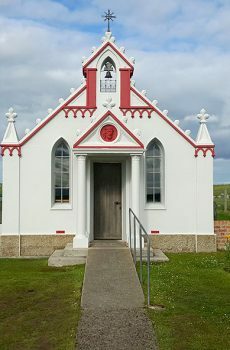 Leave the Viking city of Kirkwall and journey through the rolling hills on a trip back in time. As you take in panoramic views of the landscape, learn about Orkney’s place in the past. 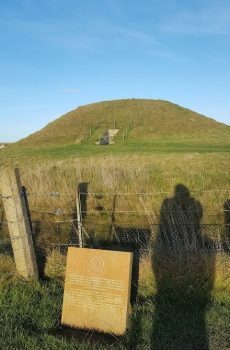 Drive past Maeshowe, the finest chambered tomb in northern Europe and one of 5,000 year old sites which make up the UNESCO WHS “the Heart of Neolithic Orkney”. Enjoy the panoramic views of the beautiful landscape and gain an understanding of the Neolithic story of the area. Then journey across the isthmus between the Lochs of Harray and Stenness and enter the Ness of Brodgar excavation. At the live excavation, see the astounding site for yourself. Learn about how the dig has evolved in the decade since it began. Marvel at the preservation of the buildings, how they were laid out, and what the site’s specialists say they were used for. Get behind the tape and see the digging in action. 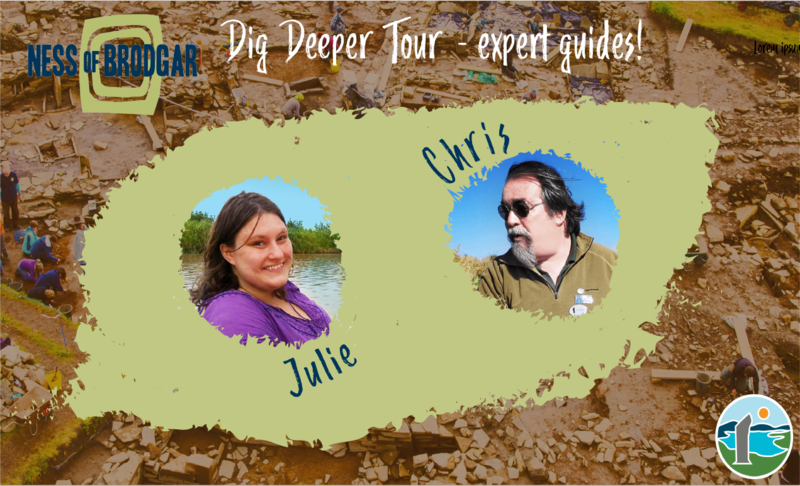 Your guide will enlighten you about the archaeological techniques and what these techniques can reveal from the dirt and stones. 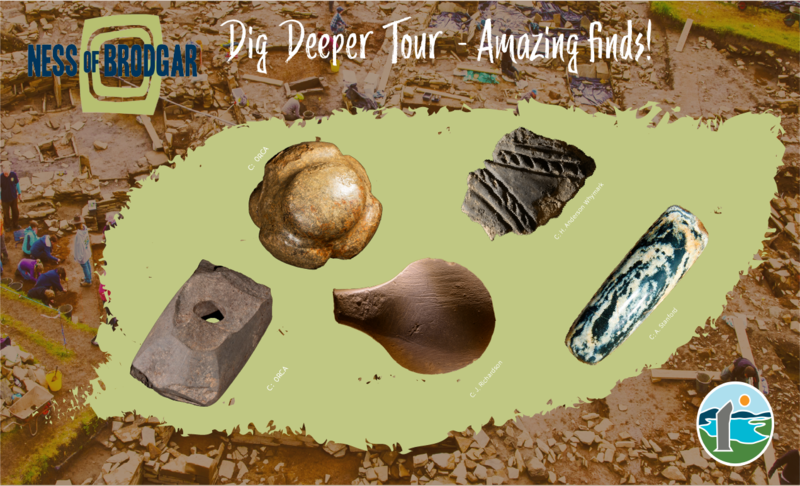 Come face to face with some of the amazing finds, including examples of the innumerable sherds of decorated Grooved Ware pottery, polished stone axes and maceheads. Further “Exotic” articles include axe heads made from Lake District stone, carved stone balls and pitchstone (a volcanic glass from Arran). The excavations also uncovered the most northerly finds, in the UK, of Neolithic amber beads. Each day of the dig brings new finds! After all this archaeological action, experience either the Ring of Brodgar or the Standing Stones of Stenness. Wander around one of these iconic sites and discover their unique story with your archaeologist guide. After two hours deep in the Heart of Neolithic Orkney, be returned to Kirkwall (journey takes 30 minutes each way). After the donation all profits go directly to the charity Orkney Disability Forum (SC019325). 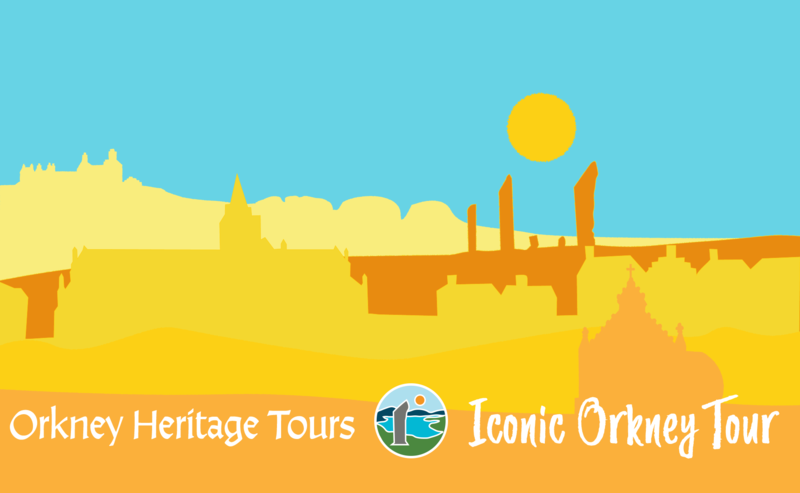 Select Date from the calendar below to start booking the tour of a lifetime! Stones & Shores – Crown Princess Extended Tour! Family tickets are available on request.